Picture - U.S. Navy PB4Y-2 from VP-23 in flight. The Consolidated PB4Y-2 Privateer was a World War II and Korean War era patrol bomber of the United States Navy derived from the Consolidated B-24 Liberator. The Navy had been using unmodified B-24s as the PB4Y-1 Liberator, and the type was considered very successful. A fully navalized design was desired, and Consolidated developed a dedicated long-range patrol bomber in 1943, designated PB4Y-2 Privateer. In 1951, the series was redesignated P4Y-2 Privateer. Picture - A PB4Y-2 carrying ASM-N-2 Bat glide bombs. The Privateer was externally similar to the Liberator, but the fuselage was longer to accommodate a flight engineer's station, and had a tall single vertical stabilizer rather than the B-24's twin tail configuration. The defensive armament was also increased to 12 .50 in (12.7 mm) M2 Browning machine guns in six turrets (two dorsal, two waist, nose and tail), with the B-24's belly turret being omitted. Turbosuperchargers were not fitted to the engines since maritime patrol missions were not usually flown at high altitude. The Ford Motor Company (which produced B-24s for the United States Army Air Forces) had earlier built an experimental variant (B-24K) using the single tail of a B-23 Dragon. Aircraft handling was improved, and the Air Corps' proposed B-24N production model was to be built by Ford, but the order was canceled on 31 May 1945 and the B-24N never entered production. The Navy's desire for substantial redesigns, however, had sustained interest in the new tail assembly. The Privateer entered Navy service during late 1944. Squadrons VPB-118 and VPB-119 were the first Fleet squadrons to equip with the Privateer. The first overseas deployment began on 6 January 1945, when VPB-118 left for operations in the Marianas. On 2 March 1945 VPB-119 began "offensive search" missions out of Clark Field, Luzon in the Philippines, flying sectored searches of the seas and coastlines extending from the Gulf of Tonkin in the south, along the Chinese coast, and beyond Okinawa in the North. The Privateer was used as a typhoon/hurricane hunter from 1945 to the mid-1950s. One aircraft, designated BuNo 59415 of VPB-119 went down when it experienced mechanical trouble when investigating a Category 1 typhoon near Batan Island in the Philippines. It attempted to land on the island, but was unable to do so and crashed. It was one of the only six hurricane hunter flights ever lost, and the only one found. Picture - U.S. Coast Guard PB4Y-2G. Privateers were also used during the Korean War to fly "Firefly" night illumination missions dropping parachute flares to detect North Korean and Chinese seaborne infiltrators. 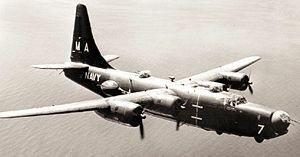 All Navy PB4Y-2s were retired by 1954, though unarmed PB4Y-2G Privateers served until 1958 with the Coast Guard before being auctioned off for salvage. The family was redesignated P4Y-2 Privateer in 1951. The earlier XP4Y-1 Corregidor was a completely different design, based on the Consolidated Model 31 twin-engine flying boat. PB4Y-2 were still being used as drones in the 1950s/early 1960s, designated PB4Y-2K initially and then P4Y-2 based names after 1951. They were then redesignated QP-4B under the 1962 United States Tri-Service aircraft designation system, part of the new patrol series, between the P-3 Orion and the P-5 Marlin. Picture - PB4Y-2 BuNo 66261 (marked as BuNo 66304) in the collection of the National Museum of Naval Aviation at NAS Pensacola, Florida. Several airframes exist in flyable condition as well as in museum collections worldwide.